I was happy to see a significant number of Holman teachers completed Schoology Courses Part I & II online training modules at home during the snow days. That is serious devotion! Quite a few teaches even completed all of the modules! This is just another great example illustrating how Schoology allows for that anytime, anywhere learning experience. Below is a screenshot explaining how you can check on your student progress regarding the online training. 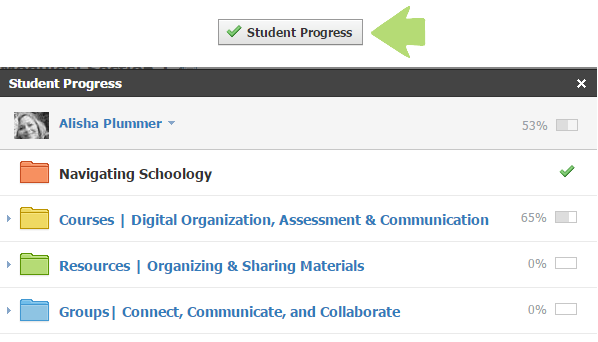 Once you access the course materials simply click on the Student Progress button. You can even check your progress within a single folder. Doing so will provide you with a visual indicator of how much of the folder or course you have completed so far. The example below shows that Alisha is 53% through all of the online training modules. She has completed Navigating Schoology and has completed 65% of Courses Part I & II. Remember to live every snow day as if it were your last snow day.